Get ready because this house is gearing up for a night of lights for Halloween. That’s right Jessica Hatch and her husband are back at it again for their annual carved pumpkin Halloween lighting display. This year the house is expected to complete over 104 carved pumpkins just in time for trick or treaters to enjoy on Monday night. Carving pumpkins for over 5 days with help from family and friends, Jessica said there’s something for the entire family to enjoy Halloween night. “We have something for everybody. There are patterns everybody of all ages will recognize. When people come up to the house…when you have a child or an adult and they show up and they recognize something, the adults at like kids, kids are excited just the happiness that everybody has makes it all worth it,” Hatch said. The pumpkin lighting display will be held Halloween night from 5 pm until midnight. There will also be a light show set to music. If you and your family want to see the show, the hatch’s house is located on Ferncliff drive near Sunset School on Hobbs. 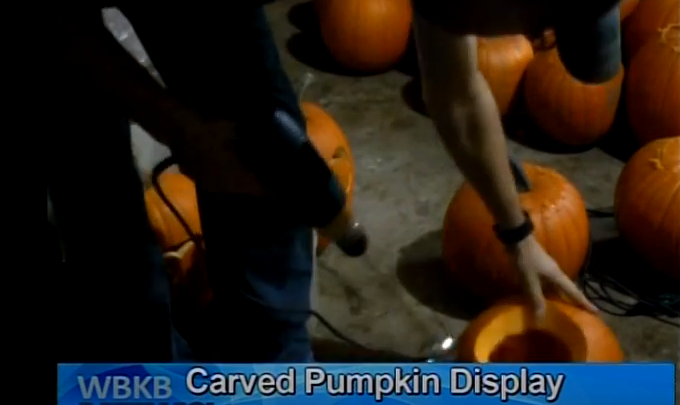 The couple also have a Facebook page called the pumpkin and lights display of Alpena, Michigan setup for directions.